November 1 was a warm, sunny day in Vermont a few seasons ago. As I walked out of the woods at the LaPlatte River Natural Area in Shelburne, I looked down at my pant legs and saw them-ticks-a dozen or more on each leg. As I brushed the tenacious ticks away I thought, “Vermont-we’ve got a problem”. Lyme disease is the most common tick-borne disease in the country, accounting for over 30,000 new cases each year. In recent years Lyme disease cases in Vermont have skyrocketed. In 2013 nearly 900 probable or confirmed cases were reported to the Vermont Department of Health, placing Vermont first in the country in terms of the incidence of this disorder. Other states with a high incidence of Lyme disease included Maine and New Hampshire. What is going on here? In North America Lyme disease is caused by a spirochete called Borrelia burgdorferi. This microorganism is transmitted by the bite of black-legged ticks (Ixodes scapularis), formerly known as deer ticks. These ticks are commonplace in our forests and are increasing, due in part to reforestation of the landscape and perhaps the effect of climate change. But this is not the whole story. Ixodes ticks have a complicated life cycle. These ticks do not live forever, thank God. Rather, they live for two years during which they undergo three successive molts, that is transformation to a larger size and different form. After hatching from an egg these stages of development are called larva, nymph, and adult. At each one of these stages the tick must ingest a blood meal from an appropriate host or else it dies. Many hosts can serve as blood donors-mice, chipmunks, deer, even birds, especially birds that nest or forage on the ground like sparrows, robins, thrushes, and ovenbirds. Once the ticks ingest a blood meal they drop off the host, hide in the leaf litter while they undergo a molt to the next stage of development, and lurk in the brush waiting to attach like a burr to their next victim. Ultimately, adult male and female ticks meet on a host and reproduce. White-tailed deer appear to be the preferred host for adult ticks. At this point the pregnant female, after ingesting a third blood meal, drops off the host and lays her eggs on the ground. If the ticks are infected with B. burgdorferi they can transmit this spirochete to their blood donors. However, not all of their hosts are “competent” to serve as a reservoir for this infection in nature. To qualify as a reservoir three conditions must be met-availability, poor grooming behavior, and an ability to tolerate chronic infection with B. burgdorferi. The mammals that best fit these qualifications are white-footed mice, chipmunks, and shrews. White-footed mice, in particular, are the most abundant and competent reservoir host. Interestingly enough, black-legged tick larvae are not infected at birth. Rather, they acquire Borrelia from a reservoir host during their first blood meal. Subsequently, the ticks are infected for life and can pass this infection on to other animals and to you. However, many animals, including deer, clear the infection rapidly and do not pass the spirochete on to ticks or to other creatures. Birds carry ticks, too, but efficiently remove them and kill them with their bills during the process of grooming. Birds also recover quickly from Borrelia burgdorferi infection and do not transmit the organism to other animals. Thus, sustaining Borrelia infections in nature involves a complicated process in which the infected reservoir population, and therefore the density of infected ticks, is regulated by the availability of food, the presence or absence of predators and competitors for that food, and the diversity and number of available hosts for black-legged ticks, only some of which serve as a reservoir for B. burgdorferi. So what about you? If you are a Vermont birder who spends time in the woods you are at significant risk of acquiring Lyme disease from a tick bite. As soon as you enter the woods you intersect with the life cycle of the black-legged tick. That is, you have entered their environment. Both nymph and adult black-legged ticks are capable of transmitting B. burgdorferi to you, but the nymphs are more problematic because they are tiny and their bite may not be recognized. Adult ticks, in contrast, are larger and are often removed before they have attached and fed. The first nymphs appear in the spring, when the temperature exceeds 40 degrees F. Nymphs that have fed successfully drop off of their hosts and develop in the leaf litter into adults. The population of adult ticks peaks in the fall. Hence, the ticks that I found on my pant legs in November were adult black-legged ticks. How likely is it that a nymph or adult black-legged tick in Vermont is, in fact, infected with B. burdorferi? The short answer is “very”. First, according to tick surveys conducted by the Vermont Department of Health, black-legged ticks are the most common ticks found in Vermont, accounting for over 75% of the ticks submitted for identification, although American dog ticks and Lone Star ticks were identified in the survey, as well. In 2013 Alan Geise from Lyndon State and Erica Berl from the Vermont Department of Health conducted a survey of ticks obtained from 12 sites in Vermont-six in the eastern part of the state and six in the western part. Both northern and southern counties were represented in this study. With the exception of the northeastern corner of the state infected ticks were discovered in every county studied. In aggregate 27% of the captured nymphs were infected with B. burgdorferi as were 62% of the adults. These percentages tended to be higher in the southern and western counties in Vermont. Once you know that the percentage of infected ticks is high, though, the exact number becomes less important, since the density of infected ticks in specific habitats varies tremendously even within a given county. Smaller forest fragments with abundant understory and leaf litter and fewer predators and competitors tend to support larger populations of white-footed mice and a higher density of infected ticks. So be careful out there! So what to do to prevent Lyme disease assuming that you are unwilling to stay out of the woods? The Vermont Department of Health makes wise recommendations for prevention encapsulated in the slogan “Repel-Inspect-Remove”. Wear light clothing to more easily recognize attached ticks. Tuck your pant legs into your socks. Spray Permethrin, an acaricide, onto your clothes. Apply 25%-30% DEET to your exposed skin. Shortly after returning from your walk in the woods check your entire body for ticks in front of a mirror. Shower within a few hours of returning home to wash off unattached ticks that you may have missed and to remove DEET. You can even toss your clothes into the dryer for an hour at high heat. Dry heat kills ticks. Each of these measures contributes independently to the success of prevention, so the more methods you use, the greater the likelihood of success. If you do find a tick attached to your skin remove it with tweezers by grasping its mouth parts at the level of the skin and lifting steadily. Don’t bend, fold, or mutilate the tick if you can avoid it. Wash the wound with soap and water to avoid secondary infection. Black-legged ticks must be attached to your skin for at least 24-36 hours before infection with B.burgdorferi is transmitted to you. The reason for this time lag is that the spirochete resides in the mid-gut of the tick and is tethered to the cells lining the gut. Once the tick begins to ingest blood, though, the organism undergoes a reorganization of the surface proteins responsible for adherence, releases its grip on the lining cells, and migrates into the tick's circulation, ultimately appearing in the saliva. It is tick saliva that transmits the organism to you. A newly-attached tick often stimulates a local inflammatory response in the skin surrounding the attachment site. This is not a sign of Lyme disease. Also, during feeding ticks become engorged with blood and increase significantly in size. At this point after removing the tick, a single dose of an antibiotic such as doxycycline given within 72 hours is often effective in preventing Lyme disease. Consult your primary care physician for advice. Don’t forget your pets. Dogs and other domestic animals can get Lyme disease and can bring ticks into the house from outside. Check your pets for ticks as well as yourself. What if, despite all of your efforts at prevention, you develop Lyme disease? Lyme disease peaks in June, July, and August, mirroring the appearance of tick nymphs, and evolves through several stages-early manifestations, early disseminated disease, and late complications. Over 70% of Lyme disease patients develop a characteristic skin rash expanding from the site of the tick bite called erythema migrans. This rash occurs 3-30 days after the tick bite and may or may not have a characteristic “bulls-eye” appearance. This rash may be accompanied by constitutional symptoms such as fever, muscle pain, and fatigue. A few weeks later other symptoms may develop such as a disseminated skin rash, stiff neck, headache, facial weakness (Bell’s palsy), or even cardiac symptoms such as palpitations. Weeks or months later asymmetrical arthritis occurs in about 30% of untreated patients, manifested by swelling of a large joint, typically one of the knees, with or without pain. Subtle cognitive disabilities may be present, as well. If the diagnosis of Lyme disease is established antibiotics can be effective in killing the spirochete. The earlier in the course of the disease that treatment is started the better. A few other diseases are transmitted by black-legged ticks, although currently these diseases are rare or uncommon in Vermont. Anaplasmosis, a rickettsial disease manifested by flu-like symptoms and depression of white blood cells and platelets in the circulation, has been reported in Vermont mainly in Bennington and Rutland counties. Anaplasmosis responds to antibiotic therapy, but can cause severe illness if left untreated and occasionally can be fatal. The number of cases of Anaplsmosis reported in Vermont, while less than 100 cases per year, has been rising steadily. Babesiosis is a parasitic disease like malaria and, like malaria, can cause severe hemolytic anemia. Babesiosis is transmitted by black-legged ticks. Only a single reported case of babesiosis that was acquired in the state (that is, not acquired by travel to other parts of the country where babesiosis is endemic) has been confirmed in Vermont. Finally, Powassan-type virus infection can be transmitted by Ixodes ticks. This virus causes encephalitis that resembles West Nile virus infection. Only one case of Powassan virus infection has been confirmed in Vermont in 1999. In conclusion Lyme disease is a multisystemic inflammatory disorder and is the most common tick-borne disease in the country. The incidence of Lyme disease has increased dramatically in Vermont, New Hampshire, and Maine during the past decade. Awareness of the risk of tick-borne diseases in Vermont is essential for individuals who spend a great deal of time outdoors. The risk of acquiring Lyme disease is best understood in the context of the life cycle of the black-legged tick and how you and your pets intersect with this life cycle. Effective means of preventing Lyme disease are available and should be used. Remember Repel-Inspect-Remove and be careful. For further information visit the Vermont Department of Health website at http://healthvermont.gov and the CDC website at http://cdc.gov and search for Lyme disease. Here is a link to my 2015 presentation about Lyme disease in Vermont and its prevention. Everybody loves loons. Listening to their yodeling call on a summer evening at a remote northern lake is truly a memorable experience. Since the Common Loon was removed from the Vermont Endangered Species List in 2005, the loon population has steadily expanded and breeding success has improved. In 2015 Vermont's loons enjoyed their best breeding season ever with 87 breeding pairs producing 67 chicks. But every chick counts. This idea was on her mind in August when GMAS Board member, Ali Wagner, came upon a lost loon chick cowering at the edge of busy route 105 in the Northeast Kingdom just east of Island Pond. How the chick found its way to this spot was a mystery. Regardless, it was in a precarious situation and Ali promptly went into rescue mode. Her companion, Tom Berriman, longtime NEK Audubon Board member, drove to the Silvio Conte NWR to access the VINS hotline, obtain permission to move the chick, and contact Eric Hanson, the conservation biologist at the Vermont Center for Ecostudies who spearheads VCE's Loon Recovery Project, while Ali tended the chick. Coached by Eric Hynes on the phone, Ali carefully wrapped the loon chick in a towel to protect its wings and legs. Later she and Tom transported the chick to nearby Spectacle Pond and released it. The chick swam toward two adult loons on the pond, but all was not well. Loons are notoriously territorial and this couple had their own chick to worry about. Later that day the rejected chick, affectionately named Little Guy, was found hiding in the reeds by Eric Hanson, who had appeared on the scene to check out the situation. Eric scooped up the chick and headed for shore. Rescued again! After another unsuccessful attempt to release the chick at a different location, Eric decided to take the bird to his home for a minnow dinner. The next day he transported the chick to a rehabilitation facility in Maine. Amazingly, this fortunate bird thrived in rehab and six weeks later it was released to the wild. This loon should be renamed. Instead of Little Guy, perhaps we should call this loon Lucky Guy. Ali wrote a wonderful story about this rescue, which appears on the Vermont Center for Ecostudies blog at http:vtecostudies.org/blog/. To read this story and the later updates go to the VCE blog and scroll down to the entries for August 25, August 31, and October 13. On Tuesday, December 8, Eric Hanson joined the members of the GMAS at the Richmond Free Library to present a program entitled The Natural (and Unnatural) History of the Common Loon. We heard more details about this rescue from Eric and Ali and learned more about the Common Loon Recovery Project in Vermont and how we can become involved. During the month of September, we celebrated a grim centennial. On September 1, 1914 Martha, the last surviving Passenger Pigeon, fell from her perch at the Cincinnati Zoo and died at age 29. Of course, this species was doomed long before 1914. The last surviving male died in captivity in 1910, leaving Martha to contemplate her lonely fate. In fact, after 1900 the only Passenger Pigeons extant survived in captivity. Wild Pigeons had gone missing late in the 19th century. …the birds poured in in countless multitudes….The air was literally filled with Pigeons; the light of noon day was obscured as by an eclipse; the dung fell in spots, not unlike melting flakes of snow; and the continuous buzz of wings had a tendency to lull my senses to repose. Audubon calculated that there were over a billion birds in one of these incredible flocks. Persecution of the Passenger Pigeons by humans was the main factor contributing to their demise. Wild Pigeons were hunted relentlessly by commercial hunters and amateurs alike. Audubon described one such “hunt” at a roosting site on the banks of the Green River in Kentucky. Hundreds of people gathered for the slaughter, surrounding the “city” of roosting pigeons. Trees were cut down or set on fire, birds were suffocated with fuming sulfur pots, thousands were knocked down by polemen, and shotguns tore holes in the dense flock knocking scores of pigeons to the ground with a single shot. The dead, wounded, and mangled pigeons were piled up in heaps, packed into barrels 300 birds to the barrel, and carted off to market. Any remaining birds on the ground were fed to the hogs. Modernity played its role in the carnage. The telegraph communicated the location of these gigantic roosts instantaneously. In addition, railroads connected rural hunting sites with urban restaurants, inns, and hotels. The pigeons never had a chance. By the early 1890’s the population of Passenger Pigeons was reduced from billions to perhaps a few million birds in widely scattered flocks. Still a few million birds is a lot of birds. For example, a few million American Wigeon might represent a healthy, stable population. In fact, a few million cormorants might be considered excessive by some. But for Passenger Pigeons a few million birds weren’t enough. As David Quammen reminds us in his excellent book The Song of the Dodo (1997) abundance is relative. Maybe Passenger Pigeons needed more than a few million birds to find the scattered concentrations of acorns and beechnuts that kept them going. Maybe they needed the social stimulation of city-sized roosts to lay their single eggs and nurture their toothsome squabs. Perhaps a nasty winter or two further depleted the stock. And, of course, there was always relentless human persecution. Whatever. By the late 1800’s there were not enough survivors among the newborn squabs to offset pigeon mortality and Passenger Pigeons disappeared from the wild. Unfortunately for Passenger Pigeons and for us the advent of the conservation movement was still in the future while the wild pigeon population was being decimated. A few feeble attempts by state legislatures at protecting the pigeon population were launched, but the laws that were passed were too little, too late and were poorly enforced in any case. Notions of wildlife conservation were nascent at the turn of the century. The first Audubon society was incorporated in 1905 and the first federal wildlife refuge, Pelican Island NWR in Florida, was created by Theodore Roosevelt in 1904.The Audubon Society was instrumental in securing the passage of the Migratory Bird Act in 1913 and promoted the enactment of the Federal Migratory Bird Treaty in 1918, which continues to protect waterfowl and shorebirds today. But by that time Martha was dead in her cage. So what is the legacy of the Passenger Pigeon? On Wednesday, October 8, author and naturalist Joel Greenberg recounted the story of the Passenger Pigeon and its extinction in a lecture at Lafayette Hall on the UVM campus. Joel is the author of an excellent new book entitled A Feathered River Across the Sky: The Passenger Pigeon’s Flight to Extinction in which he recounts the complicated factors leading to the Passenger Pigeon’s demise. The salient fact is that human activities contributed mightily to their decline. Even today human activities continue to affect bird populations adversely in the form of climate change due to the burning of fossil fuels, as amply documented in a new report from the National Audubon Society. This report predicts that over half of North America’s birds will become threatened or endangered as a result of climate change before the end of the 21st century. In support of this prediction the recently released State of the Birds report currently has 230 bird species on its watch list for birds that are at risk of extinction or threatened to become so if swift conservation action is not taken. This list is growing. On the other hand attitudes toward conservation have shifted since the 19th century. Today there are many more resources at hand that benefit birds and other wildlife. Conservation-minded organizations such as the National Audubon Society, the Nature Conservancy, the National Wildlife Federation and many others lobby vigorously on behalf of conservation. As a result of this effort federal legislation has been enacted to protect wildlife, most notably the Endangered Species Act, signed into law forty years ago this year. Furthermore, thousands of citizen-scientists participate in the Christmas Bird Count, the Great Backyard Bird Count, the National Breeding Bird Survey, and the Cornell Lab of Ornithology's eBird, providing a data base that scientists can use to track bird populations in real time. Given all this attention it is unlikely that a rapid decline in bird populations will go unnoticed. Moreover, conservation works. Witness the recovery of Bald Eagles, Peregrine Falcons, and Osprey from the ravages of DDT and the resurgence of a host of waterfowl whose populations were threatened by drought and habitat loss in the middle of the 20th century. Wetland restoration through the Federal Duck Stamp program was crucial to the success of this conservation effort. But threats remain and we must act. The legacy of the Passenger Pigeon is the observation that common birds can disappear rapidly in the face of adverse environmental circumstances, many of which are caused by human activities. Thus, the idea of keeping common birds common is more than just a mantra. Rather, this concept embraces a philosophy that promotes the continuation of life as we know it. Rusty Blackbird populations have plummeted by over 85% in the past half century and no one knows why. Recognition of the catastrophic decline of this once-common bird eluded birders and conservation biologists until the past decade. Now a group of international investigators led by the International Rusty Blackbird Working Group plans to study this problem by collecting data during the Rusty Blackbird's spring migration. Rusty Blackbirds breed in marshes and bogs in the boreal forests of Canada and the northern United States, including Vermont's Northeast Kingdom. Vermont is at the southeastern edge of the Rusty Blackbird's breeding grounds. During the Second Vermont Breeding Bird Survey nesting sites for this frequently overlooked bird declined in the western part of Vermont, but increased in the northeastern highlands, possibly due to increased effort directed toward finding their nests. Nonetheless, only 20 nests were recorded in the second atlas down from 26 in the first survey. In 2014, at the urging of several conservation groups Rusty Blackbirds were added to the list of Vermont's endangered species. Understanding the factors affecting Rusty Blackbirds on their breeding grounds, wintering habitat, and migration stopovers will be essential first steps toward stabilizing the population. To study Rusty Blackbird migration the International Rusty Blackbird Working Group initiated the Rusty Blackbird Spring Migration Blitz in 2014 in cooperation with eBird, the Cornell Lab of Ornithology and the Vermont Center for Ecostudies. To begin the group assigned migration target dates for 38 states, 9 provinces, and 3 territories asking birders to visit likely stopover points and document their observations in eBird. For Vermont the target dates are March 15 through the end of April. In 2014, its inaugural year, 4570 birders submitted 13,400 checklists to eBird with Rusty Blackbird data, a huge success. In 2015 4885 birders submitted 13919 checklists. This study will be repeated for one more year in 2016. Let's get out there and find those birds! Every Rusty Blackbird counts. The amazing irruption of Snowy Owls in North America in this winter of 2013-2014 has brought these charismatic Arctic wonders to a number of locations in Vermont. Little did we know when a single owl arrived at Perkins Pier on the Burlington waterfront on November 23rd, that we would have a flood of owls and the chance to see several in a day here in Vermont. Perhaps because the sprawling, flat, clayplain agricultural lands of western Addison County resemble the owls' summer Arctic breeding grounds, an aggregation of snowies soon built and has remained resident into the second half of February. On February 16th, 2014, a fabulous winter Sunday, over 40 volunteer observers in teams and as individuals spent a few hours or from sunrise to sunset attempting to chronicle all the owls that could be found in Addison County. While the renowned Snowy Owl at the Dead Creek WMA goose viewing area attended to passersby and owlers alike throughout the day, the owlers spread out and canvassed parts or all of 15 towns. Snowy Owls are characteristically quiet during the day and often in easy view, aiding the survey count. Many of the birds located were at sites where they were known for many days and weeks, perhaps since December. A few new locations were found, as well. In order to help assure that the number of birds counted did not include the same bird twice, observers were sent to the known owl locations throughout the day. For the most part, this technique appears to have worked well. In the densest owl population of western Bridport, it was challenging to know in a few places exactly how many birds there were. We found Snowy Owls in only four adjacent towns on Sunday – three owls in Panton, six in Addison, twelve in Bridport, and three in Shoreham. The heart of the distribution, “Owl-Alley” if you will, follows Basin Harbor Road and Jersey Street from Shoreham to Panton. It was possible to see 10+ owls in less than an hour if you were familiar with their locations. The northernmost location was on Slang Road in Panton, the easternmost were three owls scattered at locations along or near Route 22A, and the southernmost were two birds in northern Shoreham near the corner of Basin Harbor Road and North Cream Hill Road. None were on the frozen Lake Champlain shoreline. Thus the area with birds is but 18 miles from north to south, and 3-5 miles wide. We can thank the late stages of glaciation for this special topography. Large Lake Vermont, dammed by a glacier just to the north 10,000 years ago deposited extensive glacial-ground clays at its bottom creating today’s flat clayplain landscape of along Lake Champlain, which itself is a remnant of Lake Vermont. Over 200 years of farming have created the large open fields and the prey found at their margins and within. In some places the owls roost during the day well spaced from other owls, but a few territorial encounters have been observed. However, in other places it is possible to see two individuals quite close to each other. Where they spend the night seeking prey is unknown. Have you seen it? Snowy Owl? Nope. The Northern Hawk Owl? No, no. The Second Atlas of Breeding Birds of Vermont-it's a beauty. Expertly edited by Roz Renfrew from the Vermont Center for Ecostudies, the Atlas is a birder's tour de force. This book represents the work of over 350 volunteers over the five year time span from 2003-2008, making it the largest citizen-science initiative ever attempted in Vermont. At 548 pages and 5 1/2 pounds the Atlas contains a treasure trove of information that will delight birders and conservationists alike. For my money the Atlas is the best book written about Vermont's birds in over twenty-five years, that is since the First Atlas of Breeding Birds of Vermont was published in 1985. The introductory chapters cover the methods used to obtain the data, an introduction to Vermont's biogeology, and a description of the changes in Vermont's landscape during the past century that have affected Vermont's bird life. A must read chapter entitled Bird Conservation in Vermont identifies the primary threats aimed at Vermont's birds and discusses the strategies that might be implemented to ameliorate these threats. Invasive species, habitat loss, predators, and, of course, climate change are among the threats that will challenge Vermont's birds in the future. But the heart of the book resides in the 200 plus species accounts that appear in the Atlas. Written by local experts, including the editor herself, the species accounts provide a detailed snapshot of the status of every breeding bird in Vermont. Each article contains text, easy to interpret graphs and tables, a map showing the population distribution of each bird, and gorgeous photographs. The photographs themselves are worth the price of the book. These summaries are not intended to be read through in one sitting. Rather, they are intended to be savored one-by-one as Vermont's birds return to their breeding grounds. So what do the results show? What's up and what's down? The first question is "How many birds breed in Vermont, anyway?". The short answer is 202 confirmed breeders give or take a species or two. In general, woodland warblers, wetland species, and raptor populations are holding their own. Reforestation, active habitat management, and elimination of the use of avicidal pesticides have stabilized these bird populations or in some cases allowed them to flourish. Bald Eagles, Peregrine Falcons, and Osprey (not to mention Common Terns) all have benefited from intensive interventional management. On the other hand grassland and shrubland bird populations have decreased due in part to the loss of abandoned pastures and early succession forests that have steadily reverted to more mature woodlands. Grasshopper Sparrows, for example, are listed as Threatened in Vermont and Upland Sandpipers are Endangered. Bobolinks, Eastern Meadowlarks, and Golden-winged Warblers are Species of Special Concern in Vermont, whose populations have steadily declined. Likewise, aerial insectivores such as Purple Martin and Common Nighthawk (Endangered), and Eastern Whip-poor-will (Threatened) have all shown significant population declines. In fact, data from the Breeding Bird Survey were instrumental in providing the documentation necessary to list these birds as Threatened or Endangered. Special mention should be made of the boreal bird species in Vermont. Boreal forest represents only a tiny sliver of Vermont's habitat found mainly in the Northeast Kingdom. Gray Jay, Boreal Chickadee, Spruce Grouse, and Black-backed woodpecker-the NEK Grand Slam-all showed population declines since the previous survey. Similarly, Bicknell's Thrushes, breeding in the rugged habitat atop Vermont's highest mountain peaks, are under pressure as the spruce-fir habitat that they prefer disappears as a result of climate change. This summary does not do justice to the detailed information assembled in the Atlas. To learn more you will have to buy this handsome book. The editor, Roz Renfrew, is to be commended for driving this complex project to completion. Likewise the volunteers who contributed thousands of hours to the survey and the authors of the species accounts deserve kudos. The Second Atlas of Breeding Birds of Vermont is a triumph of citizen-science that will serve as the ultimate reference book for Vermont's birds for many years to come. The Atlas takes its place along side other regional and national breeding bird surveys to give us the most detailed picture yet of the status of our nation's bird life. The 66th Christmas Bird Count conducted in the Burlington circle and the 114th CBC overall is in the books and it was a good one. On a snowy December day 55 birders ventured forth, counting 13042 birds-not record-breaking for sure, but respectable. The highlight of the count was a pair of Long-eared Owls heard at MacCrae Park in Colchester by Allan Strong and the Midnight Hooters in the early morning hours. In fact, on their route from Shelburne to Colchester, Allan and the Hooters picked up six owl species (Great-horned Owl, Eastern Screech Owl, Barred Owl, Long-eared Owl, Northern Saw-whet Owl, and a Snowy Owl), showing that the owls are out there if you are willing to put in the time and energy to find them. New records were set or tied this year for Peregrine Falcon (3), Rough-legged Hawk (9), Northern Saw-whet Owl (1), Horned Lark (39), Eastern Bluebird (13), Red-bellied Woodpecker (14), Winter Wren (3), Dark-eyed Juncos (346), and American Goldfinches (484). Other notable findings were a continuing pair of Gadwall at Shelburne Bay, 9 Bald Eagles, a Northern Goshawk, Iceland and Glaucous Gulls, and 2 persistent Yellow-rumped Warblers in Shelburne. During count week two additional species were added to the count-a Brown-headed Cowbird and a Yellow-bellied Sapsucker, a new bird for our CBC. When these two birds are included in the count, we tied our previous record of 73 species set in 2005. "Southern" species continued their march into northern New England. In addition to the record-breaking numbers of Red-bellied Woodpeckers, Northern Cardinals, Tufted Titmice, and Carolina Wrens (13) were broadly represented in multiple sectors of the Burlington circle. Conversely, Bohemian Waxwings, Common Redpolls, Pine Grosbeaks, Pine Siskins, and Purple Finches-all of which were reported in last year's count-were conspicuous by their absence. Maybe next year. The day ended with the usual round up of the teams hosted by Bob and Shirley Johnson and entertainingly orchestrated by Jim Osborn. Truly this event is the highlight of our birding year. Here is a link to the final report of the Burlington CBC compiled by Eric Lazarus. The Green Mountain Audubon Center in Huntington is one of Vermont's outstanding birding destinations. The Center is one of 17 Important Bird Areas in Vermont and is listed among the "Hotspots" in the VT eBird database. For many years the members of the Green Mountain Audubon Society have performed bird surveys at two locations at the Center-the Old Meadow trail behind the office building and the Peeper Pond trail. During this time the Meadow has been managed to provide early succession habitat for a variety of breeding warbler species such as Chestnut-sided Warblers and Mourning Warblers. The Nature Walk section of this website also provides a detailed account of the Center and its habitat. For more information about the GMAC visit the Audubon Vermont website at http://vt.audubon.org/. In 2013 the GMAS created a bird checklist for the Center based mainly on our monitoring surveys. Entries into the VT eBird database for the Center and Audubon Vermont staff observations were included in the checklist, also. A total of 115 birds appear in this checklist. Warblers, flycatchers, woodpeckers, and thrushes are particularly well-represented on the list, but an impressive variety of birds was seen throughout the year. We have not yet conducted a formal breeding bird survey at the Center, but 46 species were identified as confirmed or probable breeders based on our observations during monitoring surveys and reports by the Audubon Vermont staff. The GMAS continues to monitor bird life at the Center regularly. These bird walks are free and open to the public. Specific dates and times for these walks will be posted in the Events section of this website. The Green Mountain Audubon Center bird checklist is available in printed form at the Center and at events sponsored by the GMAS. A link to a PDF of the checklist can be found at the bottom of this page. We hope that this checklist will be a useful resource for everyone who visits the Center. Once again the Green Mountain Audubon Society conducted the annual Christmas Bird Count in the Burlington circle. This year represented the 65th annual count in Burlington. Sixty-four participants scoured 13 sectors within the circle in this day-long extravaganza under the capable leadership of GMAS Board member Shirley Johnson. Enthusiasm was high, the weather was fine, and the camaraderie was palpable. Here are some of the highlights. A total of 17,991 birds were counted representing 69 species, not far from our record species count of 73 set in 2005. Records were set for Red-bellied Woodpecker (12), Tufted Titmouse (155), Northern Cardinal (269), Carolina Wren (14), Downy Woodpecker (106), Barred Owl (7), and Red-breasted Merganser (54). Look at this list. Red-bellied Woodpecker, Tufted Titmouse, Northern Cardinal, and Carolina Wren are all "southern" species that have expanded their range northward in recent years. Interestingly, the first Northern Cardinal in the Burlington area CBC was reported in 1958, the first Tufted Titmouse in 1968 (and then not again until 1977), the first Carolina Wren in 1974, and the first Red-bellied woodpecker in 1999. There is a message about climate change in this data. At the other end of the spectrum irruptive species from the north-Pine Grosbeak, Common Redpoll, Pine Siskin, and Bohemian Waxwing-were well-represented in the count. In particular, Pine Grosbeaks (193) were seen in 10/13 sectors after not being counted at all in our circle since 2007. This photograph of a Pine Grosbeak was taken at Technology Park in South Burlington. Likewise, Common Redpolls (633) were numerous with nomadic flocks encountered in 10/13 sectors as they foraged voraciously on weed seeds and birch catkins. The first Burlington area CBC occurred in 1948. That year four participants recorded 18 species and 1297 individual birds. How our Circle has grown since that time! The day ended with the usual potluck dinner hosted by the Johnsons. Jim Osborn led the always-entertaining round up of bird counts from each sector. Truly this was the highlight of the GMAS birding year. Shorebirds in Vermont are a sometimes thing. Not so much our resident shorebirds-Wilson’s Snipe, American Woodcock, and the hard-to-find Upland Sandpiper-but rather the migratory shorebirds that breed in the Arctic tundra and migrate to and from the Gulf coast, Central America, and South America. Migrating shorebirds do stopover in Vermont, but their numbers vary from year to year. In the fall Dead Creek WMA in Addison is one of the more reliable locations in Vermont for shorebirds, especially in those years when the water levels at Dead Creek are drawn down to allow vegetation to regenerate. This year was different. Although the water levels at Dead Creek were drawn down early in the summer, river bottom plants regenerated quickly, covering the mud flats and producing less than ideal habitat for shorebirds. Fortunately, the dry summer of 2012 also produced very low water levels on Lake Champlain, resulting in welcoming mud flats at Delta Park, Shelburne Bay, and Button Bay among others. A bonanza of shorebirds resulted. Which brings up the problem of shorebird identification. The good news is that shorebirds often stay put in one area while feeding, allowing birders to examine them closely. The bad news is that different shorebirds often look very much alike. Unlike warblers, for example, plumage differences between species are often not as helpful in shorebird identification. The ”peeps” (small shorebirds) are especially difficult to distinguish from one another. In the case of shorebird identification the concept of GISS (general impression of size and shape) becomes useful. The relative size and shape of the birds, subtle differences in bill length and shape, the extension of primary wing tips beyond the tail or not, provide important clues to identification. Without going into detail, the excellent book by O’Brien, Crossley, and Karlson, The Shorebird Guide, provides specific information about species identification with abundant illustrative photographs. Another source offering a concise guide to shorebird identification appeared recently on Bryan Pfeiffer’s informative blog, the Daily Wing, which can be accessed from the GMAS website or with a Google search. Which brings me to the subject of Willets. This large, stocky shorebird with a stout black bill, long black legs, and striking black wing tips highlighted by a bold white stripe in flight is relatively easy to identify. Even in good shorebird years Willets in Vermont are uncommon. In fact, VT eBird, lists this species as “rare”. And so it came as a surprise in late August when a Willet was reported first at Delta Park and a few days later at Shelburne Bay. Whether these were two separate birds or the same bird is conjectural. Fortunately, a number of birders were able to observe and photograph these birds. But a question arose, which subspecies? Willets come in two varieties-Eastern and Western. After some chatter on the VTBird list Eric Hynes set the record straight in an informative post. Eric pointed out that the bird in question was larger and paler than the usual Eastern subspecies. Most tellingly, Western Willets breed in the prairies of the western United States and Canada, but migrate to the Atlantic coast and Gulf coast in late summer. Eastern Willets breed on the Atlantic coast, but migrate in late July and early August to Central and South America, hugging the coast all the way. By late August their migration is complete. In contrast, Western Willets migrate in late August and early September and may appear inland. End of story. Western! Shorebird identification is challenging, but fun. As the story of these Willets illustrates, with good observations and photographs, a few reliable sources of information, and informed discussions among birders at all skill levels, we can all learn to identify most shorebirds. As the saying goes, where there’s a Willet, there’s a way. Far off the coast of Ecuador, straddling the equator, lies an archipelago of storied islands-the Galapagos. In 1835 Charles Darwin visited the Galapagos during his historic voyage on the HMS Beagle. In 1859 Darwin published his theory of natural selection based on his observations in the Galapagos more than twenty years earlier. Since then, the Galapagos Islands have attracted naturalists, scientists, writers, and the just plain curious (also known as tourists), drawn to the archipelago by its unique, diverse species. The Galapagos Islands (literally the Islands of the Tortoises) are especially attractive to birders visiting the archipelago partly for historical reasons, but especially to view the unique diversity of birds and other creatures produced by natural selection on isolated islands as reported by Charles Darwin over a century ago. Recently, our own Shirley Johnson presented a program entitled Galapagos-the Enchanted Isles based on her own voyage to the Galapagos. In her presentation Shirley showed photographs of the plants, animals, scenery, and, naturally, birds that inhabit the Galapagos, accompanied by lively commentary. She and her husband Bob photographed many of the fabled Galapagos birds-albatrosses, boobies, frigatebirds, penguins, and, of course, the Galapagos finches made famous by Darwin's journals. She discussed the symbiotic relationship between certain birds, like ground finches and Galapagos tortoises. These birds remove ticks and other annoying ectoparasites from the tortoise's skin with the full cooperation of the reptile. Similarly, she described the close link between the habitat of the Galapagos and the birds that live there. The nesting and feeding habits of the Cactus Finch and the prickly pear cactus, Opuntia, provided but one example. Finally, Shirley demonstrated the diversity that exists from island to island that Darwin recorded so long ago. The four species of endemic mockingbirds served as a fascinating example. Unlike the finches, Darwin had the foresight to label each of the mockingbird species he collected according to its island of residence. Later, Darwin recognized that speciation of these mockers correlated with the fact that they were able to breed in isolation, allowing their unique characteristics to emerge. Most of us will never visit the Galapagos Islands, except vicariously. This program reminded us of the singular importance of the Galapagos in the history of science, evolution, and conservation. Magnificent Frigatebird photo by Bob Johnson. In February, 2011, the public learned that most of the land encompassed by the Bolton Valley Nordic Center would be sold to a private investor and that public access to the extensive trail system would be lost. In less than two months a group of community members formed the Friends of Bolton Valley Nordic and Backcountry to protect this resource and maintain public access to it. This group of over 200 concerned citizens reached out to the Vermont Land Trust, which, in February, 2012, signed a contract to purchase this 1161 acre tract for $1.85 million. A grant of $800,000 from the Vermont Housing and Conservation Board was obtained, leaving $1,050,000 to be raised from local fundraising. This fundraising campaign is in progress. What's at risk? With over 90 kilometers of groomed and backcountry trails, the Bolton Valley Nordic Center is one of the three largest trail systems in Vermont. In fact, it's base elevation is the highest in Vermont. The Catamount Trail runs through the property and the trail system connects with many other routes, including those at the Trapp Family Lodge, Mount Mansfield State Forest, Underhill State Park, and Little River State Park. These trails are used throughout the year by colleges, universities, and public schools for outdoors events. Furthermore, the land and trails are heavily used by community groups as well as individuals, providing recreational access for people of all ages and ability levels. It is noteworthy that nearly half of Vermont's population lives within 30 miles of this property. The outpouring of enthusiasm for the Save Bolton Nordic project is a testimony to the widespread support for public access to this land. Bolton Valley Nordic provides critical wildlife habitat, as well, connecting two large blocks of state land, Mount Mansfield State Park and Camel's Hump State Park. The land also includes the headwaters and much of the watershed of Joiner Brook, which feeds into the Winooski River. As a result, the Chittenden County Uplands Conservation Project has designated this property as their highest priority for conservation. What about the bird life at Bolton Valley Nordic? The birds inhabiting Bolton Valley have not been formally identified, though the habitat likely provides breeding territory for a variety of thrushes, vireos, flycatchers, and warblers among others. To address this issue, the Green Mountain Audubon Society, lead by Board member Liz Lee, conducted monthly bird walks on the Broadway Trail through August and created a preliminary species list for Bolton Valley Nordic. We hope that this effort will increase public awareness of the value of this land and will support the VLT fundraising campaign. For more information about the Save Bolton Valley Nordic project consult the Vermont Land Trust website at http://www.vlt.org/bolton or call 802-262-1241. Humans have devastated seabird colonies in many parts of the world by excessive hunting for food and feathers and introducing mammals such as cats and rats to othrwise secure nesting sites. Worldwide, 23% of all seabird species are now globally threatened as marine pollution, coastal development, and rising sea levels due to climate change take their toll. Although seabird nesting islands seem safe due to their remoteness, they are intimately connected to human activities. For example, Maine's seabird nesting islands are affected by large populations of Herring Gulls and Great Black-backed Gulls that benefit from garbage and fishing waste hundreds of miles away. As populations of these scavengers increase, they deter smaller migratory seabirds such as puffins and terns from nesting on many of their historic nesting sites. Ironically, Bald Eagles and Peregrine Falcons, the products of other successful wildlife restoration programs, now threaten rare Maine seabirds such as Great Cormorants and Roseate Terns. Last November, Dr. Stephen Kress, the Director of the National Audubon Society's Seabird Restoration Program and the founder of Project Puffin in 1973, reviewed the techniques that he and others have developed on Maine's coastal islands that have lead to the restoration of puffins and terns on their historic nesting sites. Techniques developed in Maine have been adopted worldwide. For example, in Vermont, social attraction and the use of tern decoys, techniques developed in Maine, have been critical to the success of Audubon Vermont's Common Tern Restoration Project on Lake Champlain. In late May Audubon member Jim Morris reported that a Common Loon had appeared on a tiny stormwater retention pond located between capturing a loonShaw's supermarket and Friendly's restaurant at Tafts Corner in Williston. For the next few months this loon attracted the attention of hundreds of observers, including representatives of the Vermont Fish and Wildlife Department. The hope was that the bird would be able to leave the pond on its own; but no, it seemed to be perfectly content to stay put, subsisting on the healthy goldfish population swimming in the pond. Unfortunately, this loon was stuck. Enter Eric Hanson, the Vermont Center for Ecostudies expert on Vermont's loons and the leader of the Loon Recovery Project in Vermont. On a warm July evening Eric, his summer intern Shannon Maes, and five volunteers (Jim Wallace, Carl Runge, Jim Morris (Yes, that Jim Morris), Maeve Kim, and Bruce MacPherson) gathered to plot the capture and release of this imprisoned creature. This proved to be no easy task. The loon was skittish, diving at every opportunity, and not necessarily a willing participant in this caper. But Eric had a plan-in fact, two plans. Plan A involved launching a 12 foot aluminum boat on this little pond, powered by a small electric motor. Using a one million candlepower spotlight to "freeze" the bird and a taped loon call to attract her attention, Eric planned to approach the loon carefully and scoop her up in an oversized fish net. Easier said than done. Plan B involved stretching a gill net, provided by VT F&W across the pond, trapping the bird in the folds of the net. Really! As darkness fell, we gathered the equipment for this improbable adventure at the edge of the pond. After launching the boat, Jim Wallace steered toward the loon, Shannon held the spotlight, and Eric turned on a recording of a yodeling loon, the male territorial call. The rest of us held our collective breath. At first the loon was leery, but in a few minutes she became interested in the intruder's call and allowed the boat to approach her. In a moment-swoosh-it was over. The loon was engulfed in the net and was swiftly transferred to a padded cardboard box for safekeeping. Onshore, Eric carefully collected basic data about the bird, determining that she was somewhat smaller than most Lake Champlain loons. Shannon held the bird's beak, while Maeve held the rest of the bird securely. Eric surmised that she might be a vagrant headed for Quebec based on her small size. While all this activity was taking place Gail Osherenko filmed the action. Gail's video now appears on her blog at http://www.vermontloonblog.wordpress.com. The rest of us looked on in awe. In a few minutes this operation was over. The loon was placed securely back in her box for transport to Lake Champlain. Later that night she was released safely and successfully at the Burlington waterfront. You can learn more about this adventure by visiting the Vermont Center for Ecostudies website at http://www.vtecostudies.org/. Thanks to Carl Runge for providing a photo of the captured loon. One of Vermont's iconic summer birds is the elusive Bicknell's Thrush. A resident of the spruce-fir forests found on the mountaintops of the northeastern United States and Canada, Bicknell's Thrush is a species of conservation concern as climate change slowly strangles its breeding habitat. On June 22 and 23 members of the GMAS and invited guests journeyed to the top of Mount Mansfield to meet one of the world's experts on Bicknell's ThrushBird in the hand, Chris Rimmer, founder and Director of the Vermont Center for Ecostudies. For nearly 20 years Chris and his coworkers have studied Bicknell's Thrush on its breeding ground at the top of Mount Mansfield and other Vermont mountains and on its wintering range in Hispaniola. No one is better equipped to educate us about Bicknell's Thrush than Chris Rimmer. Even in late June the weather at the top of Mount Mansfield is unpredictable and often forbidding. Perhaps, then, it should not have been surprising to encounter dense fog, driving rain, and gusty winds when we arrived at the parking lot at the end of the Toll Road the first evening. No "dusk chorus" for us. Still, Chris was undeterred as he calmly described his research and the history and biology of Bicknell's Thrush in the montane forest. One has to admire this tough liittle bird that survives, indeed thrives, under such adverse weather conditions. The next morning was better-a literal window of opportunity as the harsh weather temporarily subsided. At 5 A.M. we gathered in the parking lot again to learn more about Bicknell's Thrush. Chris reached into his magic bird bag and retrieved a first year, banded thrush that he had captured in a mist net earlier that morning. Patiently, Chris pointed out that these tiny thrushes travel thousands of miles in migration between Vermont and Hispaniola. 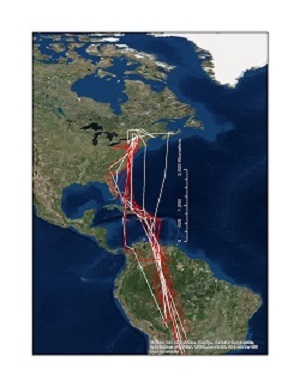 One 11 year old bird that he captured on several occasions had traveled an estimated 49,000 miles in his lifetime. Incredible. After recording basic anatomical measurements from this bird (weight, length, wing length, etc.) and allowing a few minutes for photographs, Chris handed the thrush to Jo Wright. After a moment to gain his (and her) composure, the thrush zipped off into the tangle of spruce and fir trees nearby. A few minutes later Chris released another captive bird from a mist net, a handsome, male Blackpoll Warbler. Chris went through his data gathering routine again, then handed the bird to Jo's husband Chip. The warbler seemed to be quite content resting in Chip's open palm for a few minutes, but finally was induced to return to the forest. It was a privilege to experience the unique montane habitat at the top of Mount Mansfield, even, or perhaps especially in such inclement weather. Bicknell''s Thrush, Blackpoll Warbler, White-throated Sparrow, Dark-eyed Junco, Swainson's Thrush, and Winter Wren live and breed in these mountains. We were fortunate to spend a few hours walking the narrow trails and inspecting the mist nets to learn more about these special birds and the efforts of investigators like Chris Rimmer to conserve them. Thanks to Shirley Zundell for her photo of Chris Rimmer holding a Bicknell's Thrush.